Even though these stones are quite beautiful, brown diamonds were not at the top of the popularity charts. Natural champagne or brown diamonds are the most common type of diamond that exists. They experienced an uptick in popularity only when the Argyle mine in Australia orchestrated a large scale advertising campaign with the objective of changing the perception of brown diamonds in the marketplace during the 1980s and early 1990s. Argyle was able to ensure the success of their push to bring glory and recognition to brown diamonds by aligning the diverse scope of brown diamond shades with luxury fare similarly colored such as brown and cognac. The lighter brown shade is sometimes referred to as Cognac diamonds or even Chocolate diamonds in order to further work the association for its rich and golden appearance. The idea is applying a name that better explains the color tone. As a desirable beverage that any man or woman can easily relate to, the term "brown diamonds" immediately began to attract attention and increased the desire for these stones. Eighty percent of Argyle's output consists of champagne, or brown, diamonds. Without a concerted effort by Argyle to change the image of this once forgotten color diamond, brown diamonds would not be enjoying their current commercial success worldwide. The wave of fancy color diamonds is really starting to make a big impression. The various color combinations can sometimes be mesmerizing. Only, many seem to think that most fancy colors are way too high above their budget. Granted, the rarer the stone the more expensive it will be. However, that doesn't mean that some of the more common fancy colors are out of everyones reach. Different Shades Of Cognac Diamonds. Similar to all natural fancy colored stones, fancy brown diamonds, much like pink diamonds, obtain their color from molecular level defects in their crystal lattice known as 'plastic deformation,' a state in which the lack of alignment of the atoms comprising the lattice causes holes to form and absorb light that enters the diamond. It is the absorbing of light by the cavities that gives brown diamonds their color. Different locations around the world are known for producing specific colors. The Argyle mine in the Eastern Kimberly region of Western Australia, famous for their Pink Diamond production, is one of the many areas where some of the nicest brown colored diamonds are found. Unlike other varieties of fancy colors, however, brown is not considered a self contained color but an expression of darkness of tone in hues that skew warm, namely, yellow, orange and red. A common example is best illustrated by yellow diamonds that have a dark tone, such diamonds will typically feature brown in their GIA grades. GIA defines fancy color diamonds that are 'intense' and 'Vivid' as having high saturations and lightness of tone. As a result, any diamond that has brown cannot be Intense or Vivid. Fully saturated natural brown diamonds are graded by the GIA as Fancy Deep. brown diamonds can also be given GIA grades of Fancy Light, Fancy and Fancy Dark. It is worth noting that because brown diamonds comprise a wide ranging set of hues, they tend to exhibit the greatest differences in their color presentation compared to all other fancy color diamonds. Fancy brown diamonds are frequently coupled with modifying colors of yellow, orange and pink. The presence of these secondary colors becomes more apparent as the saturation increases. 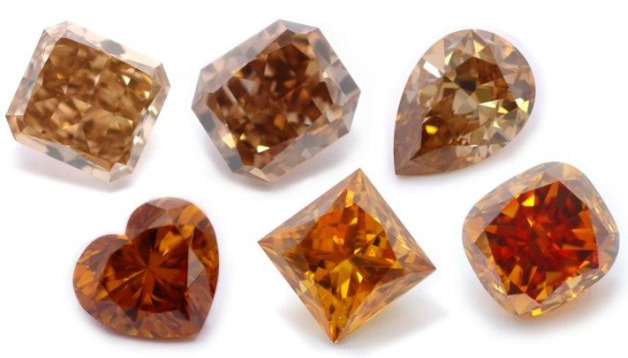 If the brown diamond is limited in saturation, however, the strength of the brown color will be limited and any modifying colors are usually absent. The further along this spectrum you go, the richer and more intense the brown is to be seen in the diamond. The more intense a diamond's color saturation, the more it will be worth. For example, a Fancy Dark Brown diamond will be worth more than a Fancy Light Brown diamond. That said, stones that are a split grade containing a much rarer color, such as Fancy Pink-Brown, will typically be more desirable and valuable than just pure brown diamonds. Argyle uses their own grading scale to grade tone and saturation in natural brown diamonds, ranging from brown-like C-1 diamonds to the deep cognac brown C-7. Tone refers to the lightness or darkness of a brown diamond, and the continuum in between. GIA grading does not make a distinction in tones, but to the eye a stone with darker tones may appear more intense in color. For someone looking for the appearance of a Fancy Dark Brown without the added cost, a good option may be a Fancy Brown with a darker tone. Natural brown diamonds do not have a marked tendency to exhibit fluorescence to UV light. On those occasions when they do show fluorescence, the resulting color is typically weak to moderate green or yellowish green or moderate to strong blue. In the final analysis, the enhancement to a stone's aesthetics that fluorescence offers is entirely subjective. All levels of clarity are possible in fancy brown diamonds. Type I brown diamonds will experience a much wider range of clarities where both flawless and I1, I2 and I3 are equally possible. On the other hand, type II brown diamonds will usually have a very high clarity, which is characteristic of all type II diamonds. Most diamonds that originate from the Argyle mine have low clarity - because the majority of brown diamonds are produced by the Argyle mine, it can be assumed that this holds true for brown diamonds in general. Natural brown diamonds can be found in all shapes, oftentimes including the round brilliant cut, which is not common in fancy colored diamonds. From an aesthetic standpoint, in brown (or champagne) diamonds, the conflation of dark color and brilliance is best shown in a round cut, which is traditionally designed to reflect white light, resulting in a diamond's scintillation. In the case of brown diamonds, a round cut does not necessarily desaturate color, as they usually have darker tones than other color diamonds. Take note of uneven color distributions as well (these will be noted on your GIA certificate), as they can certainly affect a diamond's appearance and value. Fancy brown diamonds can be found in many shapes, such as princess, emerald, asscher, oval, marquise, pear, radiant, heart and cushion. Because the bulk of the output from the Argyle and other mines results in brown diamonds, they are found in greatest abundance compared to all diamonds. In contrast to the much rarer and highly prized pink, blue, and green diamonds, they are much easier to obtain. Consequently, their accessibility makes brown diamond prices the most affordable. While brown diamond value may be low in terms of investing, their beauty is something to behold. A colored diamond is generally rare when it exists as one color without any modifying colors. However, a brown diamond that is modified by a much rarer color, such as pink or orange, resulting in Fancy Pink-Brown or Fancy Orange-Brown, will be more rare and valuable than a fancy brown diamond. Brown diamonds can be found paired with yellow, orange and pink modifying colors. The secondary colors will be most apparent as the saturation of color increases. A question that often arises among potential colored diamond buyers is, are brown diamonds more expensive than colorless diamonds or other colored stones? As a result to both how common these stones are and what the market value demanded, the prices of these diamonds are significantly lower than some of the more popular fancy colors. They are shown to be a bargain for today's diamond collectors. They can cost less than a colorless diamond of the same size and shape, however similar to other colored stones the price can vary according to the intensity, and of course the size of the stone. As a general rule, if you want a gorgeous colored diamond, but aren't interested in shelling out a large amount, brown diamonds are an excellent direction! They are priced extremely competitively compared to colorless and other fancy colored diamonds. Furthermore, they make exquisite pieces of jewellery because of the color contrasts between them and colorless stones. Before the 1980s, brown diamonds languished in total obscurity. It was Rio Tinto, the company that owns the Argyle mine in Western Australia, who singlehandedly reformed the public image of natural brown diamonds. Prior to their emergence as lower-cost alternatives to traditional colorless and fancy color diamonds, the function of brown diamonds was chiefly industrial. They originate primarily from the Argyle mine, which is the top global source of fancy brown diamonds, as well as South Africa and Russia. Rest assured, however, that fancy brown diamonds on the market today sold loose and in jewellery, are considered gem quality, whereas those used for industrial purposes are not. Fancy brown colored diamonds that contain no overtone colors at all, are notorious for their rarity and sold at various public auctions. One of the most famous brown diamonds is the Golden Pelican. It is a 69.93-carat, Fancy brown colored, Rectangular Emerald-cut diamond originally mined in South Africa. The ring was in a 14kt Gold band, owned by Baron Corso de Palenzuela von Habsburg. It is said to have been used as collateral in a bank transaction securing the freedom of Jews that fled persecution in Cuba. The stone was later auctioned at Christie's in the 1970s. Its estimated value is approximately an astonishing 3 million dollars. Another very famous brown colored diamond is the Golden Jubilee. The diamond weighs 545.67-carats and is known as the largest faceted diamond in the world. The rough it was cut from was 755-carats and was discovered in the Premier mine in South Africa in 1985. As a gift for the 50th anniversary of his coronation, the Golden Jubilee was presented to the King of Thailand in 1997. Prior to this event, the stone was simply known as the "Unnamed Brown." It's estimated value lies somewhere between $5-12 million dollars. The beauty of these stones together with the very attractive prices in the market has begun to really make an effect.